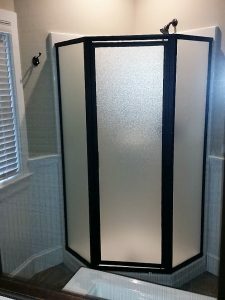 The workhorse of the shower enclosure industry still maintains it’s presence even in today’s world of Frameless enclosures. Always a good choice for fiberglass and acrylic stalls or tile surrounds. Features including full height magnet and seals to help provide maximum performance from water spray escape, to multiple hardware finishes and glass options. The framed enclosure is also an excellent choice for your smaller stalls that might require the highest level of resistance to water escape. Also a popular choice for the high maintenance kids bath, pool house shower or the guest bath at the lake house. Examples of this product choice can be viewed in our Gallery.